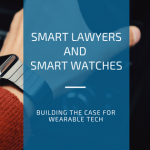 As new technology develops it seems to slip past the legal profession in New Zealand, but something we think lawyers and other professionals should take a serious look into is the use of wearable technology, specifically smart watches and see how they can add value to you personally and your firm. Smart watches are an extension of your smartphone like the smartphone was to the tablet and the laptop was to the desktop computer, the watch is just the next revision in what seems to be an endless cycle of technological disruption that improves our efficiency, communication, accessibility and responsiveness. Technology is disruptive, no one can doubt that, just think about how long you spend looking at all those notifications after you have stopped what you’re doing to find your phone and check a notification only to see it was some random person that has added you on LinkedIn. This is where the smartwatch is significantly less obtrusive and can aid in the removal of irrelevant distractions. Some people say it helps them stay less stressed and more focused. How? by being able to quickly glance at their watch and seeing if it’s important enough to respond to or action. But ultimately the main benefits of a smartwatch is its ability to reduce the number of steps to receive, process, and disseminate information with our peers, helping us become more efficient, accessible and organised, but it can be so much more. As the technology develops and new apps are created you might soon find yourself tracking time in a meeting, as it directly uploads and syncs with your practice management solution or you find yourself dictating to your watch as you drive from the meeting and have it write up the document so it’s completed when you get back, filed away and checked off. I initially thought the Apple Watch was a gimmick, but after having one and seeing put to work in its natural environment, I came to love it. Phone calls in a meeting are undisruptive, and no one in the room knows that I’ve ignored it by covering my wrist. The use of a smartwatch is subtle in application but big on impact.